Looking for the 2013 edition? It is still available for purchase. Click here for more information. 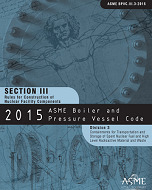 New this year - if you order the redline edition of any 2015 BPVC section, you will receive both the official version of the code in print format, and a corresponding redline delivered electronically for one low price. BPVC-III-3-2015 contains the rules of Division 3 and constitute requirements for the design and construction of the containment system for nuclear spent fuel or high level radioactive waste transport packaging.